VATICAN CITY (CNS) — Even though Pope Benedict XVI will spend his retirement near Rome and then inside Vatican City, he will not play any role in the upcoming election for a new pope, and he will not interfere with the responsibilities and decision-making activities of the new pontiff, the Vatican spokesman said. Rather, the new pope will have the prayerful support and empathy of someone who understands “more than anyone in the world” the burden and responsibilities of being a pope, said Jesuit Father Federico Lombardi. The spokesman also confirmed that Pope Benedict has a pacemaker and has had it “for some time.” He said the battery recently was changed, but that the procedure had nothing to do with the pope’s decision to resign. Father Lombardi made his remarks Feb. 12, the day after the 85-year-old pope announced that, because of his age and waning energies, he was resigning effective Feb. 28. The Jesuit spokesman described as an “indiscretion” a report in the Italian newspaper Il Sole 24 Ore, which said Pope Benedict had gone to a private Rome clinic three months ago for a small “procedure” to change the batteries in his pacemaker. The spokesman confirmed it was true and said it had been a “normal” and “routine” procedure. The newspaper said the pope, who was elected in 2005, has had the pacemaker for 10 years. Father Lombardi confirmed it was put in while the pope was still Cardinal Joseph Ratzinger, prefect of the Congregation for the Doctrine of the Faith. In response to questions about how a conclave and a new papacy will be played out while a former pope is still alive and living in the vicinity, Father Lombardi said, “there will be absolutely no problem” because Pope Benedict is a discreet and “extremely scrupulous” person. No one would ever expect from him any “interference or comments that would cause even minimal awkwardness or problems for his successor,” he said. “Rather, his successor will feel supported by the prayers and intensely loving presence and interest from someone who, more than anyone in the world, can understand and be interested in the worries of his successor,” the priest said. “Pope Benedict will surely say absolutely nothing about the process of the election,” the spokesman said, “and not intervene in any way in the process,” he said. “You can be totally sure that the cardinals will be autonomous in their decision” in deciding on the next pope, he added. 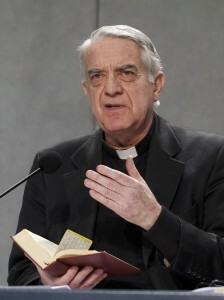 Father Lombardi told journalists that the pope was free to decide where he wanted to live in his retirement. A monastery in the Vatican Gardens is currently being renovated for the pope’s future residence. It will “guarantee him a certain autonomy and freedom,” but at the same time, allow him to remain in the Vatican. It was not clear who would be moving in with the pope to serve as his assistants, but Father Lombardi said the residence is small and number of staff would be, too. Father Lombardi also announced that Pope Benedict’s Ash Wednesday Mass Feb. 13 was transferred from its ancient, traditional site to St. Peter’s Basilica because of the large crowd expected. The spokesman said the Ash Wednesday Mass was expected to be the last large liturgical event of Pope Benedict’s papacy. All of Pope Benedict’s appointments for February — his general audiences, his meeting with Italian bishops making their “ad limina” visits and his annual Lenten retreat with the Roman Curia Feb. 17-23 — were confirmed, Father Lombardi said. He told reporters that the pope’s annual meeting with priests from the Diocese of Rome would take place as planned Feb. 14, and the pope was expected to use the occasion to talk about his personal experiences at the Second Vatican Council. Pope Benedict’s last general audience, Feb. 27, is likely to be held in St. Peter’s Square instead of in the Vatican audience hall since the hall holds only 7,000 people and the square can hold tens of thousands, he said. Father Lombardi said that, at least as of Feb. 12, no special events were scheduled to mark the end of the pope’s pontificate. Events already on the pope’s calendar would provide ample opportunity for Vatican officials and pilgrims to see the pope and show their affection without having to add additional appointments, he said. When asked why the pope chose the exact hour of 8 p.m. Rome time to step down from his office, Father Lombardi said that was the hour the pope normally ended a normal work day and was not according to any “juridical rule,” but more to reflect an established routine. The Vatican spokesman said the pope’s fourth encyclical, a letter on the theological virtue of faith, was unlikely to be ready for publication before his resignation at the end of the month. The hoped-for document will either not be published under his pontificate or it will not appear “in the usual form of an encyclical,” he said. Giovanni Maria Vian, editor of the Vatican newspaper, L’Osservatore Romano, had written in the paper’s Feb. 12 edition that the pope had started to think about stepping down after his trip to Mexico and Cuba in March 2012. Father Lombardi said the trip undoubtedly played a role in the pope’s ongoing reflection about retiring. He said although the pope went to Lebanon in September, Mexico-Cuba was the last big papal trip that crossed a number of time zones before having the usual full slate of liturgies, events and meetings. The weight of travel with a busy schedule perhaps helped the pope realize he would “not be able to handle these kinds of commitments” in the future, the Jesuit said. Because of the unusual occurrence of a pope resigning, Father Lombardi said a decision would have to be taken “by the right people” concerning what happens to the pope’s nonpersonal effects that are associated with his ministry as pope, such as his fisherman’s ring and his official seal. “I think obviously that if they are things or objects tightly connected with the Petrine ministry, well then, these things should be removed because this pope no longer exercises his ministry” after Feb. 28, he said. Concerning what the pope will be called after he steps down, that, too, needs to be determined, though it was certain he would not hold the title of cardinal, nor would he be eligible to hold any office in the Roman Curia, because he is over 80 years old. However, it was conceivable that he could be referred to as “bishop emeritus of Rome,” he said. While Pope Benedict will not be attending World Youth Day in Rio de Janeiro in late July, the weeklong gathering is a time for youth to be with the pope, and it is very likely the new pope will be there, Father Lombardi said. When the pope told organizers he “confirmed the presence of a pope, he did not promise that it would be him,” the spokesman said. According to rules governing a conclave, the College of Cardinals can begin proceedings for a papal election 15 days after the start of a “sede vacante,” which begins Feb. 28 at 8 p.m., and no later than 20 days after that date, which puts the dates at March 15-20. Father Lombardi said the pope certainly was careful about choosing a date that would allow the world’s cardinals to take part in a conclave and election without interfering with their duties back home leading Holy Week and Easter celebrations. Father Lombardi said he expects there will be a new pope by Easter, March 31, reminding journalists that Pope Benedict was elected just 17 days after the “sede vacante” that began after Blessed John Paul II’s death.